(Jamie Records) 16 Tracks - 1957-1961 - Stereo version of the original LP from 1964! Slight traces of the cover in spite of the original shrink-wrap! Duane Eddy is the original rock 'n' roll guitar hero. His 1950s guitar instrumentals like Rebel Rouser and Forty Miles Of Bad Road inspired countless kids to start playing the guitar, and many of rock music's icons list him as a major influence. His style is instantly recognizable, a bold statement of tone and attitude, a Spaghetti Western movie set to music. Duane Eddy was born on the East Coast of America, in Corning, New York, on April 26, 1938. His childhood was spent in Corning and other upstate New York towns like Bath and Penn Yan, before his family moved to Tucson, Arizona, in 1951. A year later, the family moved to the small town of Coolidge, Arizona. Duane fooled around with music from the age of five, when his father showed him a few chords on the guitar. When Duane was nine years old, his aunt bought him a lap steel guitar. After the move to Arizona, Duane continued to play both lap steel and the standard guitar. Country music was the biggest thing in Duane's musical world, and like many other up and coming guitar players, he loved the thumbpick-and-fingers style playing of Chet Atkins and Merle Travis. Duane's father managed the local Safeway grocery store in Coolidge, having transferred there from a similar job in Tucson. 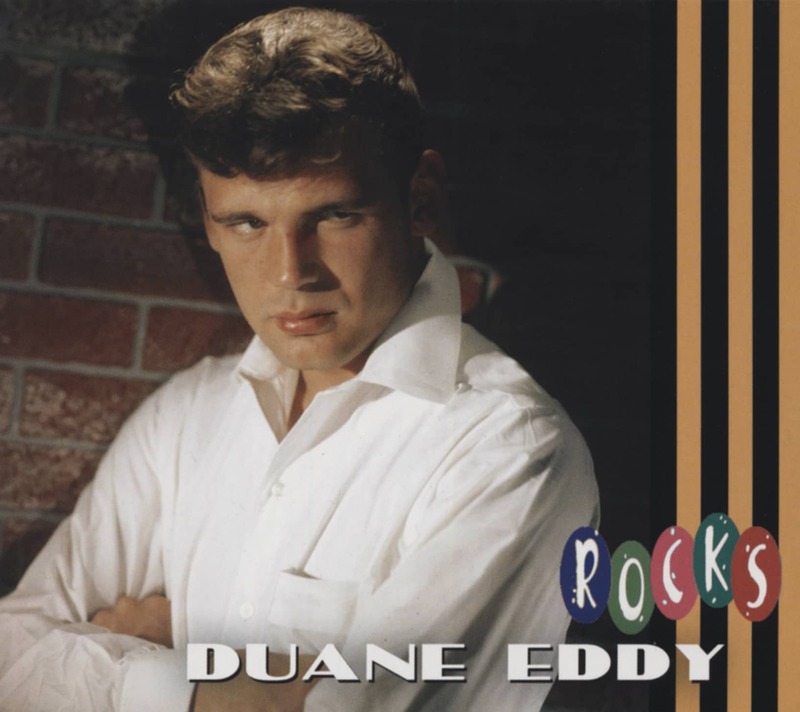 A local disc jockey got into a conversation with Duane's father one day and learned that Duane was an aspiring guitarist, so the disc jockey offered to record Duane at the station, which the jock played on the radio and announced as being by local boy Duane Eddy. When Duane's rendition of Chet Atkins' Spinning Wheel aired on the station one Monday morning, a young man Duane's age named Jimmy Delbridge (aka Jimmy Dell) came running up to Duane at school, and asked him to come over and play some music with him later in the afternoon, after school. Duane joined Delbridge (and his brother Bill Delbridge on banjo, and Duane's friend Ed Myers on rhythm guitar) and began playing local dances a few weeks later as Jimmy & Duane, The Coolidge Kids. Ed Myers, rhythm guitarist in the group, had an interest in becoming a radio disc jockey, so he went around to the local station WCKY looking for advice on how to break into the business. In doing so, Myers met a disc jockey named Lee Hazlewood, then an up-and-coming disc jockey fresh from broadcasting school in California. 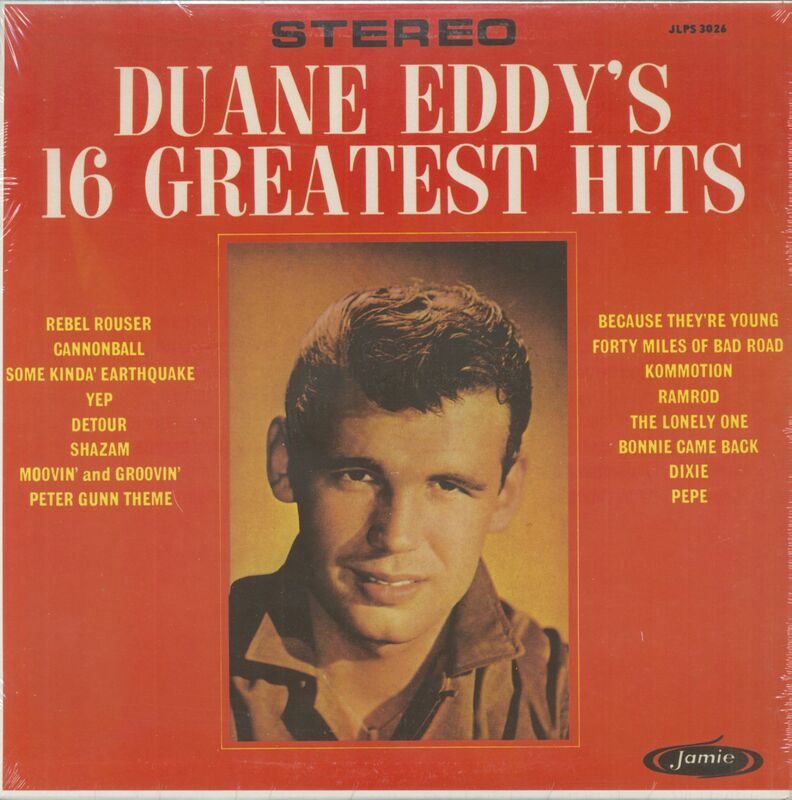 The beginning of Duane Eddy's musical career is irrevocably intertwined with that of Lee Hazlewood. The Oklahoma-born Hazlewood was nine years older than Duane, and after studying broadcasting in California had come to Arizona to disc jockey on radio station KCKY. Hazlewood was a minor celebrity of sorts in Coolidge, known for his on-air personality Eb X. Preston, a character he used to exchange on-air banter with himself while announcing records. After Myers met Hazlewood and introduced Duane to him, Lee and Duane became friends, and Hazlewood became the informal manager of Jimmy & Duane. Hazlewood soon thereafter drove Jimmy and Duane up to Phoenix to be on a talent show there that Ray Odom presented on Saturday nights at the Madison Square Garden, a boxing venue in Phoenix. A year later, Hazlewood took a disc jockey gig on KRUX in Phoenix, and later KTYL. Phoenix was a major metropolitan area, especially compared to sleepy Coolidge, and offered many more opportunities. After the Phoenix show proved successful, Jimmy and Duane realized that Phoenix offered much greater opportunities than Coolidge. Soon thereafter Hazlewood took Jimmy & Duane into a studio in Phoenix called Ambassador Recording, and cut two Lee Hazlewood-penned songs with the group, Soda Fountain Girl and I Want Some Lovin' Baby. Duane recalls that the studio was a tiny studio in the back of somebody's house, and that Lee hired Buddy Long and his Melody Boys to be on the session. 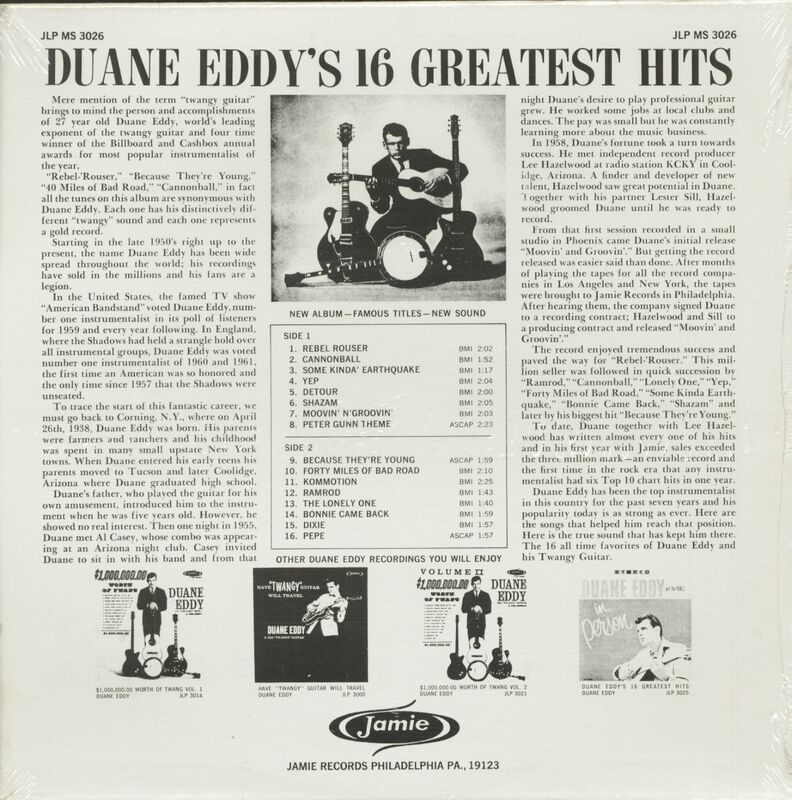 Customer evaluation for "Duane Eddy's 16 Greatest Hits (LP)"